It is an undeniable aspect of the national reality that we now experience any given phenomenon in terms of before or after September 11, 2001. This new American flag represents our reality more accurately, paying tribute to the heroes that sacrificed, the innocent victims that were lost, and the courage and resolve of the survivors--we, the American people. We also remember how the laws were changed to protect us, yet not without sacrifice to our rights and privileges as citizens. This flag is a representation against the notion that the actions our government has taken since 2001 are not radical. Certainly the debates on the amendment would be lively, improving the health of our democracy, and inspiring a vital assessment of the direction our country is headed. A video survey of American flags flown by institutions on major north-south and east-west thoroughfares in Milwaukee. Map of Milwaukee businesses who fly the current 50 star flag. 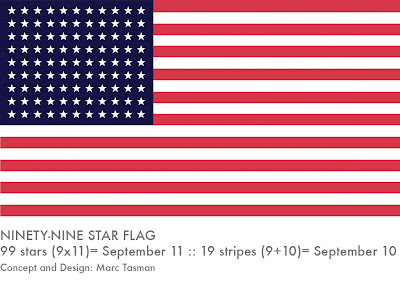 These places will be the first to be offered the new 99 star flag when it is adopted. Colors of the push pins identify the different types of institutions. Red: Health and Human Services including churches, labor unions, nursing homes. Blue: Government, including parks, monuments, post offices, and other facilities. Turquoise: Retail Services serving individuals. Yellow: Education including schools and libraries. Purple: Manufacturing facilities operating on an industrial scale. Pink: Entertainment, including restaurants, bars, video rentals. 2. The evil doers struck, and when they did, they aroused a mighty land. 3. We've entered into a new era. The imagery is vivid. 4. A new threat for freedom. 5. A new war, a new way of thinking. 6. The evil ones have sparked an interesting change in America. 7. A pivotal moment in history, where we will plant our flag. 8. The new law recognizes the realities. 10. A new spirit in America. We see it in the countless flags. A collection of videos submitted by YouTube users which were found by conducting a search for "American Flag." Descriptions submitted by users accompany the titles below. WARNING: The following contains graphic and extreme representations of Patriotism, Nationalism and War. Viewer discretion is advised. 1. 911 Exclusive "God Bless The USA and The National Anthem"
"Designed to honor, respect and support the American People who lost their lives on September 11th 2001." "A found footage compilation about the history of the American Flag, and its different meanings throughout." "This is a preview of History of American Flag Making. The DVD is available at our website." From The Micallef Programme (2000) - ... From The Micallef Programme (2000) - Season 2. "In this sketch Shaun plays an proud and patriotic American flag maker who is keen to share his American Pride with the rest of the world.... with a funny twist at the end!" "Ted Turner says media has no business showing American Flag." "Penn & Teller stir up controvery on the West Wing when they burn a flag in the White House." "This is an expression of art, I do not agree with this war, I have the upmost respect for everyone fighting to keep america free, I don't think we should be fighting for big oil companies,,, Sadam is Dead we should be satified with that and leave, the only reason we're still there is to control what happens to all that oil.....ps Bush is as big of a joke as Clinton was. god bless america, hell nobody else will." "Patriotic music video of American Flag." "Whitney Houston- Star Spangled Banner (Super Bowl 25, 1991)." "The infamous ad with her draped in the american flag with backup dancers Jose and Luis, (courtesy of madonna-tv.com)." "This is the first 'fully' patriotic video that ive made. Now, before i hear any protesting...i know that the Shock and Awe campaign didnt have anything to do with the 9/11 attack but it is very hard to find videos of the attack on the taliban forces, so just pretend :P "
"The Great Kat/Sarasate's Zapateado is a patriotic, AMERICA LOVING, U.S.A. RULES Video! Juilliard grad, The Great Kat STUNS the world with VIOLIN AND GUITAR VIRTUOSITY! http://www.greatkat.com." "This was a popular station sign-off film for a number of TV stations in the 1970's, 80's and 90's depicting the history of America from the establishment of the Jamestown settlements through our initial trips to the moon." To Senator Feingold a request was made to introduce legislation on the floor of the Senate, and to President Bush, a request to support this amendment to change the American Flag. No response has been received from either the Senator or President.